Electrochemical research yields experimental data which require the development of specific quantitative models. These models rely on the principle that electrochemical reactions can be divided into steps, e.g. transport of species to and from the electrode, homogeneous and heterogeneous electron transfer, surface reactions etc. These steps are represented by partial differential equations coupled to initial and boundary conditions dependent on the experimental techniques. The models seek to describe the time and space dependence of concentrations, involve many variables and are often too complicated to be solved analytically. The advent of electrodes with difficult geometries, e.g. microdiscs, scanning probe microscopes, polymer modified electrodes, has increased the complexity of the boundary conditions and has amplified the need for numerical simulations. We build up programmes to model electrochemical reactions, in particular to simulate the response of microelectrodes for applications in conventional electrochemical studies and in scanning electrochemical microscopy. For this we have developed simulations based on Explicit Finite Difference, Alternating Direction Implicit, Boundary Element Method, Adaptive Finite Element Method and even random walk algorithms. Fulian et al., Applications of the boundary element method in electrochemistry: Scanning electrochemical microscopy. Journal of Physical Chemistry B, 1999. 103(21): p. 4387-4392. Fulian et al., Applications of the boundary element method in electrochemistry: Scanning electrochemical microscopy, part 2. Journal of Physical Chemistry B, 1999. 103(21): p. 4393-4398. Amphlett, Numerical simulation of microelectrodes, PhD Thesis, University of Southampton, Southampton, 2000. Amphlett, J.L. and G. Denuault, Scanning electrochemical microscopy (SECM): An investigation of the effects of tip geometry on amperometric tip response. Journal of Physical Chemistry B, 1998. 102(49): p. 9946-9951. 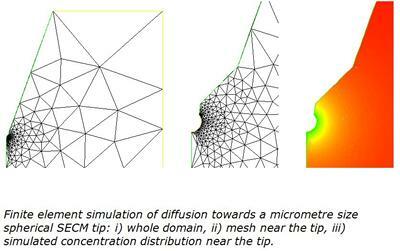 Abercrombie, Numerical Simulations of Diffusion Controlled Reactions, PhD Thesis, University of Southampton, Southampton, 2004. Abercrombie, S.C.B. and G. Denuault, Steady state simulation of electrode processes with a new error bounded adaptive finite element algorithm. Electrochemistry Communications, 2003. 5(8): p. 647-656. Lindsey et al., Scanning electrochemical microscopy: Approach curves for sphere-cap scanning electrochemical microscopy tips. Analytical Chemistry, 2007. 79(7): p. 2952-2956. Leonhardt et al., Scanning electrochemical microscopy: Diffusion controlled approach curves for conical AFM-SECM tips. Electrochemistry Communications, 2013. 27(0): p. 29-33.